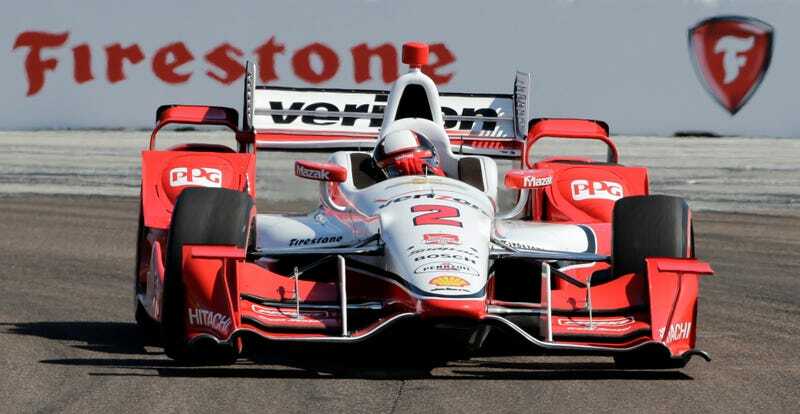 According to RACER, eleven of the twelve Chevrolet engines used in the IndyCar season opener had illegal engine repairs made after the Grand Prix of St. Petersburg. Chevrolet earned 128 points for their successful weekend, but they've now been penalized 220 points for the banned repairs. Oops! What Chevrolet did wrong was make a "non-minor engine repair" after the race. IndyCar competitors have four engines to last them the entire 10,000 miles of the season. 20 points are deducted if an engine doesn't last for its entire 2,500-mile life span. Likewise, if a major repair (such as a component swap) has to occur before an entire engine is scheduled to be swapped out, 20 points will be deducted from that car's standings. "We discovered an issue in durability testing after these race engines were built, and decided to make repairs as a precaution," Chevrolet IndyCar program manager Chris Berube told Crash.net. Chevrolet was dominant at the Grand Prix of St. Petersburg, leading 105 of 110 laps. Winner Juan Pablo Montoya earned 50 point for his Chevrolet-powered win, and he was followed by two other Chevrolets on the podium. Needless to say, Ryan Hunter-Reay and the Hondas may be the luckiest people in IndyCar right now. Hunter-Reay scored the highest-finishing spot for the Hondas, coming in seventh place. Honda earned a total of 70 points for the race. Now that Chevrolet is in the red points-wise, Honda has a 162-point lead on them. Clearly, Chevrolet's commanding speed came at a price. Here's hoping that the rest of the races don't mandate the same repair afterwards. Otherwise, this will be known as the Season of Honda (pending no additional screw-ups on the Honda side, of course).